We dare you to take our Family Health Challenge! The kids are headed back to school — so there’s no better time for this challenge! Ready to boost your health and strengthen your family? Try a family meal time! We challenge you to have at least one meal where everyone sits down together to eat at home. Well, in today’s world, time eating together is increasingly becoming a rarity. That’s especially the case for time eating together without technology involved. Sitting down together for a family meal can help encourage conversation and strengthen family bonds. But beyond that, family meals also offer some recognized health benefits. 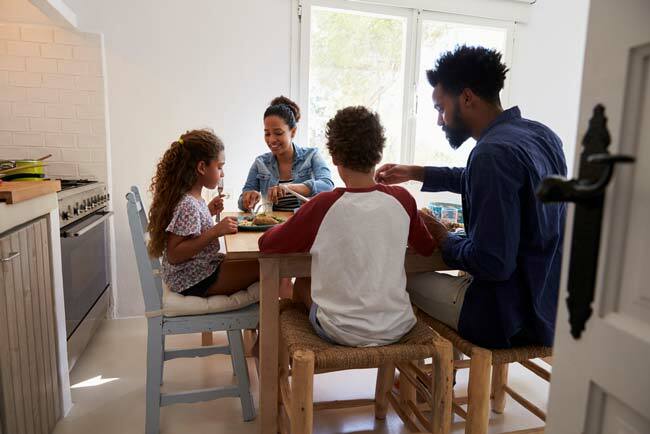 For one, when you eat at home together as a family, you’re more likely to eat healthy, less processed foods. The foods you eat will usually contain less sugar and salt than you’d find in a restaurant. When you’re cooking at home, you also have the opportunity to branch out and try new fruits and veggies — and recipes — offering your body the nutrients you need. And while there are some specific food-related health benefits, the benefits for your little ones might be the best! Studies have found that kids who have regular family meals have better grades and better behavior. They’re also less likely to smoke, drink alcohol or use drugs. Young girls, in particular, stand to benefit. Adolescent girls who have regular family meals are less likely to develop eating disorders. Choose the menu together. Plan it out ahead of time and try to include a new ingredient each time! Head to the grocery store together and choose a fruit, vegetable or grain you haven’t tried before. Then look up recipes containing that food. Involve the kids in cooking. Even the tiniest of tots can be given age-appropriate tasks during meal preparation. And once they help cook, they’ll be more likely to eat what they made. Use the nice plates. That doesn’t have to mean use the family china. But treat your family dinner like a special occasion! You could use paper plates that your kids have decorated, or special ones you picked out at the store — doesn’t matter as long as they’re a special treat. Put away the technology. During this family meal, concentrate on the food and on each other! Turn off the TV and put phones in the other room. It might feel weird at first, but your entire family will benefit. Are you up for the challenge? Post a photo of your family dinner in the comments! Another great way to boost the health of your family? Get your annual checkups. If you haven’t had one yet this year, schedule yours today.